The figure above is from paper article #30. "The basic result was that even as the lower atmosphere gradually warms, the upper atmosphere rapidly cools. The simulations employed constant low solar activity conditions, to remove the effects of variable solar and geomagnetic activity. Global mean annual mean temperature increased at a rate of +0.2 K/decade at the surface and +0.4 K/decade in the upper troposphere, but decreased by about -1 K/decade in the stratosphere-mesosphere, and -2.8 K/decade in the thermosphere. Near the mesopause, temperature decreases were small compared to the interannual variation, so trends in that region are uncertain." 7. Do SST gradients drive the monthly climatological surface wind convergence over the tropical Atlantic? "A global increase of 0.19°C per decade during the past 50 years (through 2015) accelerated to 0.25°C per decade during the last 30 years, a faster increase than in the mean annual temperature. Strong positive 30-year trends are detected in large regions of Eurasia and Australia with rates higher than 0.60°C per decade. In cities with more than 5 million inhabitants, where most heat-related fatalities occur, the average change is 0.33°C per decade, while some east Asia cities, Paris, Moscow, and Houston have experienced changes higher than 0.60°C per decade." "The results show that the magnitude of warming in East Asia is approximately 0.2°C higher than the global mean. Most populous subregions, including eastern China, the Korean Peninsula and Japan, will see more intense, more frequent and longer lasting extreme temperature events under 1.5°C and 2°C warming. The 0.5°C lower warming will help avoid 35%-46% of the increases in extreme high-temperature events in terms of intensity, frequency and duration in East Asia with maximal avoidance values (37%-49%) occurring in Mongolia. Thus, it is beneficial for East Asia to limit the warming target to 1.5°C rather than 2°C." "Equilibrium climate sensitivity (ECS), defined as the long-term change in global mean surface air temperature in response to doubling atmospheric CO2, is usually computed from short atmospheric simulations over a mixed layer ocean, or inferred using a linear regression over a short-time period of adjustment. We report the actual ECS from multi-millenial simulations of two GFDL general circulation models (GCMs), ESM2M and CM3 of 3.3 K and 4.8 K, respectively. Both values are ~1 K higher than estimates for the same models reported in the Fifth Assessment Report of the Intergovernmental Panel on Climate Change obtained by regressing the Earth's energy imbalance against temperature. This underestimate is mainly due to changes in the climate feedback parameter (−α) within the first century after atmospheric CO2 has stabilized. For both GCMs it is possible to estimate ECS with linear regression to within 0.3 K by increasing CO2 at 1% per year to doubling and using years 51-350 after CO2 is constant. We show that changes in −α differ between the two GCMs and are strongly tied to the changes in both vertical velocity at 500 hPa (ω500) and estimated inversion strength (EIS) that the GCMs experience during the progression towards the equilibrium. This suggests that while cloud physics parametrizations are important for determining the strength of −α, the substantially different atmospheric state resulting from a changed SST pattern may be of equal importance." "Based on the high-sensitivity observations, we find that Arctic September sea ice is lost with low probability (P≈10%) for global warming of +1.5 ° C above pre-industrial levels and with very high probability (P>99%) for global warming of +2 ° C above pre-industrial levels. For the low-sensitivity observations, September sea ice is extremely unlikely to disappear for +1.5 ° C warming (P<<1%) and has low likelihood (P≈10%) to disappear even for +2 ° C global warming. For March, both observational records suggest a loss of 15% to 20% of Arctic sea-ice area for 1.5 ° C to 2 ° C global warming." "By influencing the ocean heat uptake efficiency and by shifting the pattern of heat uptake, global air temperatures are significantly altered on a multidecadal time scale by AMOC variability." "In NW European Russia transportation and domestic combustion from Finland was important. A systematic underestimation was found in W Siberia at places where gas flaring was important, implying miscalculation or sources." 49. 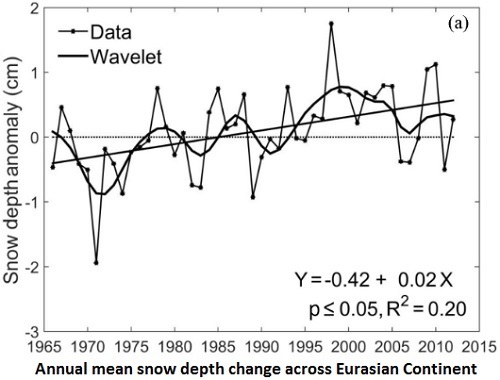 Warming autumns at high latitudes of Europe: an opportunity to lose or gain in cereal production? "Warming autumns have insignificant potential for additional cereal yield gains. Even the latest maturing wheat cultivars would mature by the same time or earlier than currently when sown earlier. However, inter-annual variability in harvest times remains high, and hence many emerging risks may result from the elevated autumn precipitation in the future that will accompany delayed harvests." "Two invasive species, Ageratum conyzoides and Parthenium hysterophorus, will lose overall suitable area by 2070, while Ageratina adenophora, Chromolaena odorata and Lantana camara will gain suitable areas and all of them will retain most of the current habitat as stable." "We find that the norm of keeping coal in the ground remains essentially contested. Even in those countries that have introduced some form of a coal mining moratorium, the ban can easily be, or has already been, reversed. To the extent that the norm of keeping coal in the ground has momentum, it is primarily due to non-climate reasons: the Chinese moratorium was mostly an instance of industrial policy (aiming to protect Chinese coal companies and their workers from the overcapacity and low prices that are hitting the industry), while the USA’s lease restrictions were mainly motivated by concerns over fiscal justice." "We found that including the impact of land use and carbon cycles had a profound effect on the results for global warming impact potential. It changed the ranking among the different routes for PE production, sometimes making biomass-based PE worse than the fossil alternative." "Here, we provide a brief summary of the project design, expanding on its relation to the scenario literature, and an overview of the papers included in the issue. While we leave the discussion of results mainly to the synthesis paper, we extend it here to include some additional detail on the relationship between BRACE results and those from other avoided impact studies, and emphasize future research needs." "Results indicate that permafrost was continuously present in peatlands during the last 6000 years in some present-day continuous permafrost zones and formed after 6000 BP in peatlands in the isolated to discontinuous permafrost regions. Rates of permafrost aggradation in peatlands generally increased after 3000 BP and were greatest between 750 and 0 BP, corresponding with neoglacial cooling and the Little Ice Age (LIA), respectively. Peak periods of permafrost thaw occurred after 250 BP, when permafrost aggradation in peatlands reached its maximum extent and as temperatures began warming after the LIA, suggesting that permafrost thaw is likely to continue in the future." "A focus on the last 2 centuries shows a recent warming characterized by a well-marked warming trend parallel with increasing greenhouse gas emissions. It also shows a multidecadal variability likely due to natural processes acting on the internal climate system on a regional scale. A ∼ 16–30-year cycle is found in Alaska and seems to be linked to the Pacific Decadal Oscillation, whereas ∼ 20–30- and ∼ 50–90-year periodicities characterize the North Atlantic climate variability, likely in relation with the Atlantic Multidecadal Oscillation. These regional features are probably linked to the sea ice cover fluctuations through ice–temperature positive feedback." 77. How will air quality change in South Asia by 2050?